Pennsylvania Senator Pat Toomey led the fight to keep unlimited carbon pollution spewing from our power plants, ignoring the climate threat and putting over one million Pennsylvanians at higher risk for asthma attacks. Instead of protecting public health, he protected the profits of the polluters who donated over $1 million to his campaign. 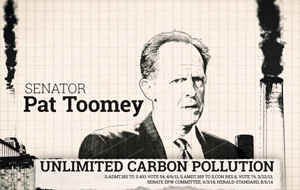 Take action today: Tell Senator Toomey that Pennsylvania deserves climate action. Your efforts to continue unlimited carbon pollution from America's power plants aren't just disappointing. They're reckless and Pennsylvania deserves better. Voting to block the Clean Power Plan means undermining our best current option to reduce climate pollution from its largest source. The greenhouse gas pollution that power plants put in our atmosphere is driving climate change and threatening our kids' futures. It not only increases asthma attacks but it poses a real danger to our economy and our way of life. Our families, communities, and children are counting on your leadership.